Erin Willis, M.D., left, is recognized as a Pediatric Partner in MS Care by Danielle Morrison, a representative of the National Multiple Sclerosis Society. March 26, 2019 | Sometimes to make a difference, you have to chart your own path. It’s safe to say that Erin Willis, M.D., did just that. Willis is the first and only pediatric neurologist in Arkansas specializing in the treatment of multiple sclerosis in children. From left, Danielle Morrison with the National MS Society; Erin Willis, M.D. ; Debopam Samanta, Interim Section Head of Pediatric Neurology; and Gregory B. Sharp, M.D., chief medical officer at Arkansas Children’s Hospital. It’s a role she chose for herself while still in her residency at UAMS and its partner, Arkansas Children’s Hospital. And it’s a role she is now being recognized for on a national level. “When I was in training and saw a family with a child diagnosed with suspected MS, they were often traveling out of state to see a specialist,” Willis said. “Arkansas is a rural state, so these families often didn’t have the resources to travel for care. I just didn’t think it was fair, and I looked at everything we have at Children’s and UAMS and thought that these families should be served too. 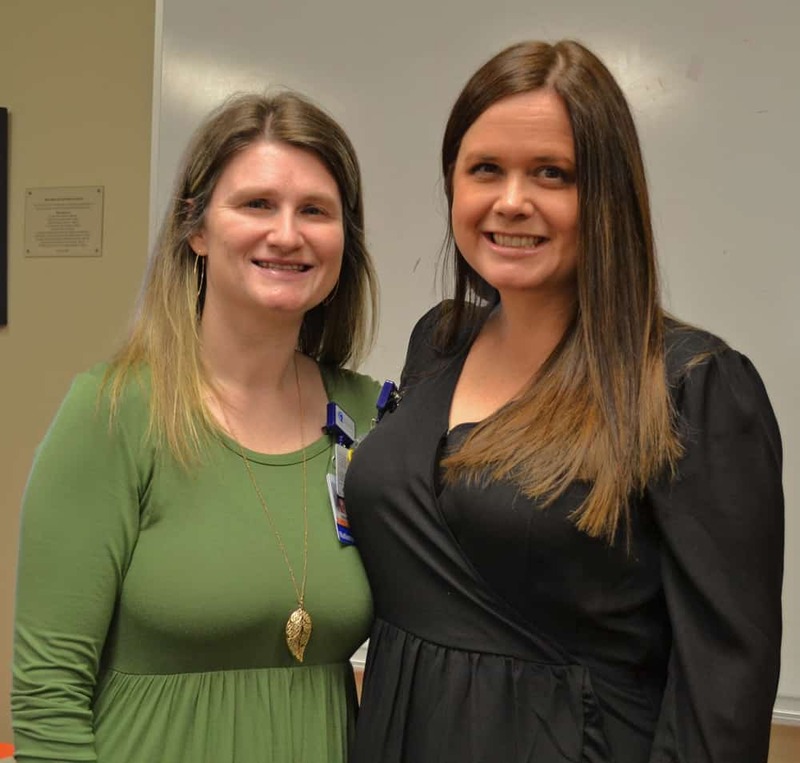 So I took that opportunity and I talked to my mentors and leaders and said, ‘This is what I want to do, this is where my passion is.’”In March, Willis was named a Pediatric Partner in MS Care by the National Multiple Sclerosis Society. The designation recognizes a commitment to providing exceptional, coordinated MS care regardless of geography, disease progression and other disparities. Willis, right, with the MS clinic nurse, Kara Christensen. The neurology faculty helped Willis get the training she needed, including a visiting rotation in pediatric MS at the Mayo Clinic in Rochester. Today Willis sees patients in her MS Clinic at Arkansas Children’s. With the Partner in MS Care designation, she is now listed on the society’s website along with other MS experts from across the nation so that newly diagnosed families can quickly find the help they need from a trusted source. The only other Partner in MS Care in Arkansas is Robert “Lee” Archer, M.D., chairman of the Department of Neurology in the UAMS College of Medicine. He sees adult MS patients at UAMS and also helped train Willis. Multiple sclerosis is an unpredictable, often disabling disease of the central nervous system that disrupts the flow of information within the brain, and between the brain and body. Symptoms vary from person to person and range from numbness and tingling, to walking difficulties, fatigue, dizziness, pain, depression, blindness and paralysis. MS affects more than 2.3 million worldwide. MS is typically diagnosed between the ages of 20 and 50, with at least two to three times more women than men being diagnosed with the disease. Although less common in pediatrics, studies suggest that 2-5 percent of all people with MS have a history of symptom onset prior to age 18. However, doctors often miss this diagnosis as they are not expecting to see it in children. Willis’ group of patients is small, but their treatment is vital. To qualify as a Partner in MS Care, Willis doesn’t just see patients in the clinic, she participates in MS education and advocates on behalf of affordable access to high-quality MS health care for everyone living with MS. In presenting Willis with the Partners in MS Care recognition at a reception in her honor, Danielle Morrison with the National MS Society called Willis a “jewel.” Her mentors at UAMS and Children’s couldn’t agree more. Gregory B. Sharp, M.D., chief medical officer at Children’s Hospital, praised Willis for seeing the need and stepping in to fill it. For Willis’ part, she’s glad she found her path, even if it is one less traveled by.